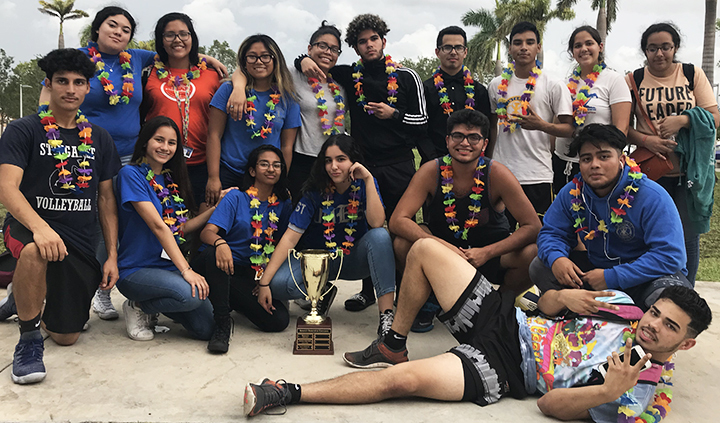 Interact taking first place with the Club Tournament Trophy. Honoria and 5000 Role Models held their annual Club Tournament after school on May 16th in front of Building 1 where HOSA, Thespians, 5000 Role Models, Interact, Key, Beta and Honoria played against each other in different events including: Running races, Hula hoop, Wheelbarrow race, Relay race, Egg race, Sack race, Balloon popping and Tug-of-war. In the end, Interact won the 1st place, followed by Beta in 2nd and 5000 Role Models in 3rd. Beta and Interact competing against each other in Tug-of-war.